Before I met my husband, he ran with a pack. He had four dogs at home under one roof — a boxer, a cocker spaniel, a Chihuahua and a blue heeler — and as he described it, it was utter chaos. Take more than two dogs to the dog park or around the block for an evening walk, and you’ll get a few funny looks. It’s the general consensus that one or two dogs per household is acceptable in America. Any more, and you might become known as the local dog lady, and you may find that your two legs can’t keep up with your wolf pack. Statistics support this accepted norm — the American Veterinary Medical Foundation confirms that the 36.5 percent of dog-owning households in the U.S. have 1.6 dogs on average. How many pets you have can also depend on where you live. People in the Northeast, who most likely live in urban areas with less backyard space, have fewer pets than the Midwesterners living in wide-open spaces. But this still doesn’t answer the question everyone wants to know: Is it OK to have more than two dogs? How many dogs are too many? How many dogs can one person or family reasonably handle? While Three Dog Night probably wasn’t talking about pet companionship when they sang “One is the Loneliest Number,” many pet owners take this to heart. The thinking is that, just like humans, man’s best friend can get lonely when it’s left at home alone all day long without another animal friend. Rounding out that 1.6-dogs-per-household statistic, pet owners often decide to get a second dog to keep their first dog company. This was our rationale when we adopted a second Chihuahua to pair with our first. We figured that since our family was gone or busy for most of the day, at the very least the dogs would have each other. After eight years as yappy frenemies, our plan appears to have worked. On the good days, our Chihuahuas seem to take comfort in each other. But the decision to get a second dog isn’t always so straightforward, cautions Dr. Patrick Mahaney, Los Angeles house-call veterinarian and owner of California Pet Acupuncture and Wellness (CPAW), Inc. There are several things to consider before adding dog number two to your pack. “Having several dogs in one’s household can be a positive or negative experience, depending on a variety of factors. If your household contains very young children, elderly folks or those having compromised mobility or immune system function (cancer, HIV, pregnancy), then having more dogs could contribute to increased household demands, stressors or even create the potential for injury or illness (flea/tick-borne disease, intestinal parasites, etc. ),” Dr. Mahaney says. David Wright of iWorkdogs is a fan of owning multiple dogs — as long as certain criteria are met first. Wright says that contrary to popular belief, one reason not to get a second dog is for the sole purpose of keeping the first dog company. “The problem is when people get new dogs to keep their current dogs company. That’s not always a good idea. It’s like if your parents were to pick your friends. There’s no guarantee that the dogs will get along,” he explains. If we all followed Wright’s golden rule for pet ownership, then backyard dog packs would never get out of control, and the world would be a happy place. It’s important to focus on the training and behavior of one dog before adding another, as Wright noted, but most pet owners are still looking for a solid number. How many dogs in one household are considered safe? This is where the good news comes in. 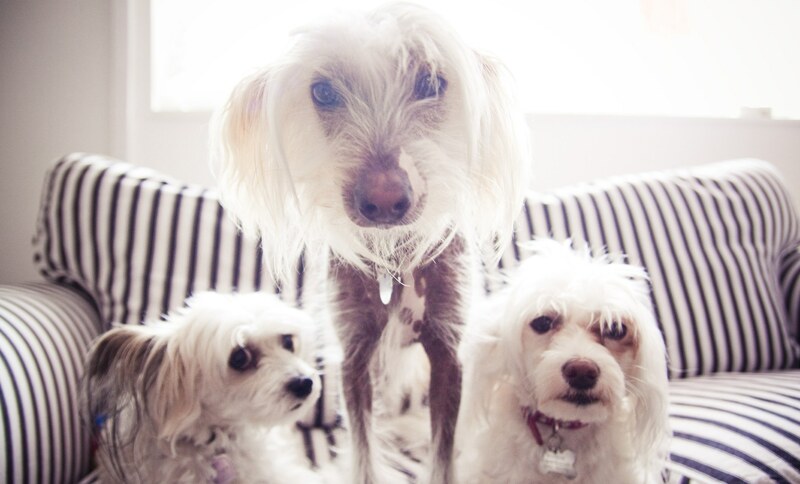 Most animal care experts widely agree that three is not a crowd when it comes to owning more than one dog. Unlike that dreaded middle child syndrome you see in three-kid families, having three well-trained pups can be harmonious when the dogs balance each other out. “It has been my experience working with pets and pet owners that three dogs is the perfect ‘tribe.’ I especially like the idea of having the dogs be of various ages,” says pet grief coach Judy Helm Wright. Right now we’re a two-dog family, but I have no problem pointing out the error of my husband’s ways if he ever wants to expand to a four-dog household again. The “right” number of dogs in a home is an individual decision and depends on factors like time, space and money — three small dogs would be easier and cheaper to care for than three large dogs, for example. But as Nash and Wright pointed out, that’s where the balance starts to tip to a point that can be dangerous for a domesticated dog pack: Three’s company, and four dogs are too many.